Michael Skynner (Pfizer) will be in the Commonwealth Building, Hammersmith Campus on 24 June at 11am to 1pm and available for informal ad hoc discussions on any aspect relating to rare disease research and the Rare Disease Consortium (RDC). This is an opportunity for you to simply meet with Michael or to discuss, in a non-confidential and informal setting, ideas for drug discovery projects at any stage of progression that could form the basis for future interactions between Imperial College London and Pfizer. There will be a formal sign-up sheet containing 20 minute bookable slots (please express preferred time slot to Vjera Magdalenic-Moussavi) and in addition there will be an open drop in session between 1pm and 2pm. About the Rare Disease Consortium agreement (RDC): The agreement is the first of its kind and enables scientists from the GMEC partners; University of Cambridge, Imperial College London, King’s College London, Queen Mary University London, University College London and University of Oxford to work with Pfizer scientists on joint drug discovery programmes. Bringing together the scientific and clinical excellence of the Universities and Academic Health Science Centres in the GMEC cluster with the drug discovery and development skills of Pfizer will accelerate the translation of basic science into drugs for patients. 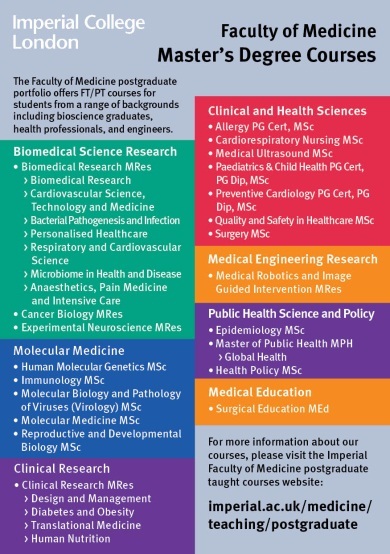 From a very strong field of 300 applicants, fourteen outstanding students have been awarded Scholarships by the Faculty of Medicine to support their Master’s study and research when they join Imperial in October. Dean’s Scholarships covering fees and a £17,500 stipend were awarded to four exceptional applicants (one home, one EU student and two overseas), while a further ten outstanding students received Faculty Scholarships of £17,500. Of these, two were home students, three EU and five overseas. Many congratulations to our Scholars (listed below). 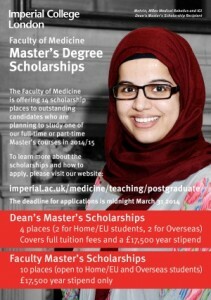 Scholars are taking programmes across our Master’s portfolio of 31 courses, from MRes degrees in Experimental Neuroscience, Cancer Biology, Biomedical Research & Clinical Research (Diabetes & Obesity), through science MSc programmes in Immunology, Human Molecular Genetics, Molecular Medicine, Epidemiology and Paediatrics, to an MEd in Surgical Education and a Master’s in Public Health (Global Health). The awards were the culmination of an e-mail and poster advertising campaign which has seen Master’s applicant numbers increase by 22% over the same time last year, and overseas numbers by 34%. Many thanks to our very photogenic 2013-14 scholars (in last year’s precursor to the current scheme), who generously agreed to grace the posters, and to PGT Administrator Jim Osborne for designing them. The success of the scheme meant an enormous amount of work to score 300 detailed online applications, shortlist 30 candidates for interview, Skype interview each, and decide who would get the Dean’s and who the Faculty awards. This was made possible with the generous help of Laki Buluwela, Kirsten Dalrymple, Andrew Edwards, Dan Elson, Christine Franey, Gary Frost, Steve Gentleman, Mick Jones, Birgit Leitinger, Mark Sullivan and Ernesto Yague. Many thanks to everyone. Awarded Faculty Scholarships: Patricio Alzaraz Couret (Paediatrics), Emily Barnes (Cancer Biology), Mei Ran Abellona U (Biomedical Research), Madeleine Hurry (Experimental Neuroscience), Lakshmi Regnier Cadavieco (Molecular Medicine), Viktoriya Nilolova (Experimental Neuroscience), Alison Ower (Epidemiology), Petros Christofides (Epidemiology), Robin Schafer (Public Health – Global Health) and Gala Farooq (Clinical Research – Diabetes & Obesity). £10M is available over 5 years to demonstrate proof of concept and ability to scale. All of the 6 challenge themes map to Imperial activities and expertise! Tony Hall, Lord Rees Brian Cox, Kevin Fong and Attenborough were all there to launch the Prize. Lord Rees Chairs the committee which has short-listed the six themes. The Longitude Prize 2014 has been set up by the BBC, Nesta and the TSB, to mark 300 years since the (original) Longitude Prize. Details were broadcast on the One Show and on a special Horizon episode (celebrating 50 years of Horizon), after which, voting opened. The nation gets to vote on the six challenge areas, with only the most popular being tackled. The chosen theme will be announced 25 June. Dr James Seddon, Clinical Lecturer in the Department of Medicine, co-presented a webinar entitled “Regimen Design and Dosing for Children with Drug-Resistant TB: A Case-Based Discussion” that was organized by the Sentinel Project for Paediatric Drug-Resistant Tuberculosis, on Friday April 25 2014.